UC Santa Cruz music lecturer William Coulter earned his bachelor’s degree in music from UC Santa Cruz, a master of music degree from the San Francisco Conservatory, and a second master's degree from UC Santa Cruz in ethnomusicology. 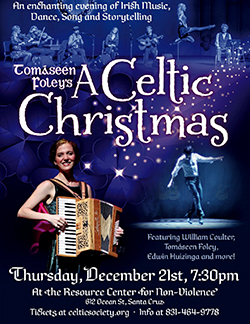 For the past two decades, storyteller/director Tomaseen Foley’s A Celtic Christmas has toured throughout the country, offering a staging of a night before Christmas at a remote farmhouse in the west of Ireland during the 1940s and 50s. Featuring traditional Irish music, dance, song, and storytelling, it presents a cultural, family-friendly feast, recalling a communal way of life that is no longer with us today. The show’s music director is award-winning guitarist William Coulter, who has been performing and recording traditional music for nearly 25 years. Coulter earned his bachelor’s degree in music from UC Santa Cruz and a master of music degree from the San Francisco Conservatory. During his classical studies, he was always drawn to traditional Irish and American folk music. This led to a second master's degree from UCSC in ethnomusicology--with an emphasis on traditional Irish music, language and song. 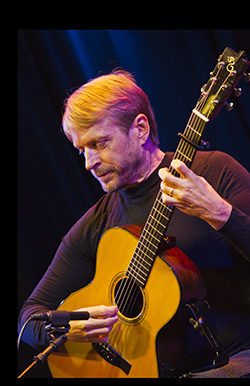 Now a longtime lecturer in the Music Department, Coulter maintains a classical guitar studio at UC Santa Cruz and also teaches at various summer music camps. In 2005, he was awarded a Grammy for his contribution to The Pink Guitar, a collection of solo guitar arrangements of the music of Henry Mancini. "This show is led by my dear friend Tom Foley," Coulter added. "His story-telling has become the backdrop to my December every year, and his artistry never fails to warm my heart and give me faith in the goodness and generosity of the human spirit." 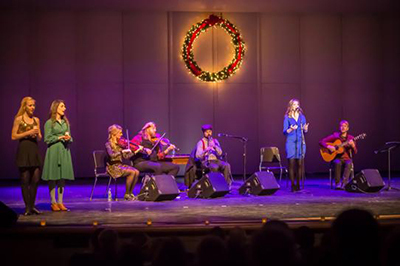 As part of the 2017 holiday tour, A Celtic Christmas is coming to Santa Cruz on Thursday, December 21, beginning at 7:30 p.m. at the Resource Center for Nonviolence. The show features Coulter (guitar and music direction), Tomaseen Foley (native Irish storyteller), Bigley (uilleann pipes, Irish flute, dance), Edwin Huizinga (fiddle), Kara Mathias (Irish song), Samantha Harvey (accordion and dance), and Marcus Donnelley (dance). Musical collaborations have always been a big part of Coulter’s career, and they have generated many tours and recordings including Song for Our Ancestors with classical guitar virtuoso Benjamin Verdery; Time to Sail, and Westward with Kerry-born Irish singer Eilis Kennedy; Simple Gifts--Music of the Shakers with cellist Barry Phillips; and Celtic Requiem with Irish vocalist Mary McLaughlin. Coulter’s music can be found on Windham Hill Records and Gourd Music, and his recordings have also appeared on compilations produced by the Narada label and Hearts of Space. His book of transcriptions, Celtic Crossing, is published by Mel Bay, and includes all of the music from his Gourd Music recording of the same name.